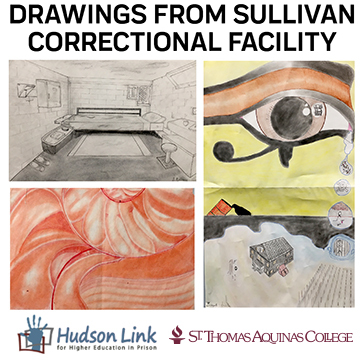 St. Thomas Aquinas College offers a bachelor’s degree program at the Sullivan Correctional Facility and is proud to exhibit 25 drawings of students from our May 2019 graduating class. Please join us for a reception and talk with Sharon Lindenfeld, adjunct professor of art, on Tuesday, January 29, 2019, in the College’s Lougheed Library at 3:30 PM. Sullivan Correctional Facility, about 80 miles northwest of the college, is a maximum-security prison with approximately 550 inmates. In May 2019, Sullivan Correctional Facility will hold its first STAC commencement with twenty graduates. The STAC program enrolls 20-25 men in its classes, and offers four courses each Summer, Fall, and Spring semester. Typically, students work full-time in the prison while taking three or four courses in the evenings. Their degree requirements in Social Sciences prompt them to take several courses in psychology, history, and sociology as well as courses in the humanities, such as philosophy and film, art history and drawing. The students in Fall 2018’s ART 205: Drawing Skills and Processes, produced numerous drawings. Professor Lindenfeld chose those she thought were representative.